After managing 10 miles in my longest run to date I decided I should go for it again so as not to lose momentum. The difficulty I had was that I didn’t want to drive over to my parents which is where I started the last one so I decided to just go for it from home. I said to myself ‘aim for 10 and see how you feel’. I also took an energy gel with me as my husband kept talking about how I was going out on an empty stomach but he would have toast, banana, porridge, protein shake and gels during a run. We quickly established I clearly have fat to burn and he doesn’t (great conversation ha ha). As usual it took about 3km before I settled in to the rhythm completely – I’m told this never goes, you just have to get used to it. I felt ok and said to myself I would try the gel at 10km. Truth be told I was hoping for a 10k pb as I have been taking part in an online running challenge but I didn’t get it. The gel was a SiS black currant flavour. It was ok but the texture and after taste took a little getting used to. Could have done with a drink of water with it truth be told. It was sticky too which was very distracting. I didn’t really feel pushed on or an oomph from it but it also didn’t make me feel sick or give me a sore stomach which I have read happens a lot. I pushed on to 16km (which is about 10miles) but as it was a different route I wasn’t home yet. That was fine with me, still felt ok. So I kept saying to myself ‘come on it’s only another 5k to make it half marathon’. At the same time though I was also saying to myself ‘don’t push it, you don’t want an injury, you’ve taken it sensible so far and are doing well’. So naturally I came to a cross roads at 18km. Turn left to go home, or turn right to add that 3km. The last stretch home was definitely that – a stretch. I’m glad I pushed though, I proved to myself I can do that distance. And I didn’t hurt after either! I did drink about 2 litres of water which tells me I need to hydrate at that distance but I’m not one to run with water – going to have to work out something on that. I forgot to stop my running app at 13.1miles so I didn’t get my exact time on that distance but I think it was just longer than 2hours. I’m happy with that! I want to try again soon but I have an operation this week so I think that’s going to set me back a little. The husband and I signed up for our first trail race on the way back from Tough Mudder. One the girls helping organise it was on the bus and she was talking about it so we decided to give it a go. She kept saying it was really really tough but honestly, I’d just completed Tough Mudder, come on. The race was scheduled for the day after we got back from holiday (and for those of you following my blog you will realise that’s the day after run or dye). The weather wasn’t looking great but the rain looked like it was holding off so could have been worse. We arrived at Moncreiff Hill to find only 2 other cars there – this didn’t look right. Turns out there were 2 car parks and we were at the wrong one! A quick dash round (and 2 more cars joining the convoy) and we found the start. There were a few from my work helping out at the event and another doing it – ha had also done Tough Mudder with us. He was saying he didn’t feel too great though and nearly pulled out but he was here and he was doing it. We collected our bibs and raving chips and as I looked around all I could see were people from proper running clubs – everywhere! Yeah, I was definitely coming in last on this one. I had prepared myself for it though as I knew I was going to find it tough so I had read lots and lots about how it feels and I had gotten myself in to a place where I was ok with it. I wasn’t a trail runner, I was doing this as a challenge. After checking what the time limit was (there wasn’t one phew) it was off the to the start line and away we went. Uphill, up, hill, uphill. That’s pretty much how the first few kilometres went! And when I say uphill I mean practically vertical! The husband stayed with me for about 100yards then casually said he might try and go on – fine with me, I knew where I was ending up on this one. I tried to keep pace with the guy from my work who wasn’t feeling great but I lost him after about 2km, ah well. I did find that I was keeping pace with another gentleman though and we occasionally exchanged chit chat going round. Mainly along the lines of ‘have you done much of this before?’ Me – no, just road running, Him – I ran about 2 weeks ago. There were quite a few ‘holy crap’ expressions coming from me as soon as we hit the downhills, as steep as it was uphill the down hill was crazy! There were marshals everywhere on the course which was fantastic but the one they had there to warn you of the sharp decline and sharp rocks – not going to lie – made me question what I was doing! Still, after the steep down hill was the water station but I declined a drink and kept going, still kind of hoping I might catch up with the work guy. Back up hill and I reached a part of the course called ‘Lucy’s Lane’. This was named after a very young girl who had had meningitis and was fighting it. Now, I am told not a single soul managed to run up that lane, it was near impossible. As difficult as it was though I really feel it was a very poignant part of the course that reminded you just how hard and difficult it is when someone has meningitis – it really reminded me of why we were doing this. Finally one of the marshals said ‘last hill then it’s the home stretch’. There seemed to be quite a gap in front of me and I was thinking there can’t be many behind me if anyone at this point, the gentleman I had kept pace with was now out of sight in front. I was fine with this, I knew it was going to be a struggle. I managed to pick up the pace going down the hills and even managed a smile for the cameras, crossing the line at just over an hour with my husband cheering me on. After some much needed water and a chat to see how the other half had done I went over to the mini van that gave me a read out of where I placed. I knew by then I wasn’t last as others were still coming in so to me this was success! When the read out told me I was 72nd out of 120 I was very pleased – and when it said 6th in my category I was ecstatic! Couldn’t have predicted that! 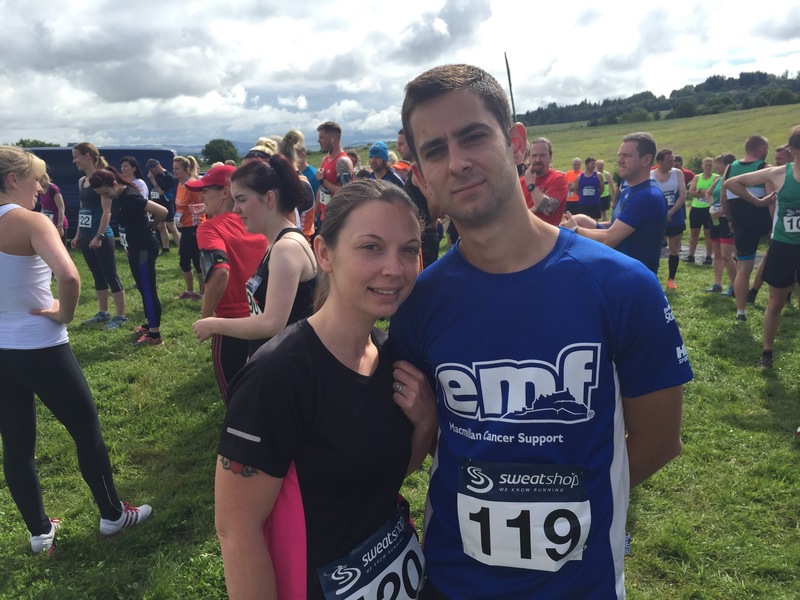 For their first Trail Race the organisers did superb! They warned it was a tough route (and my god it was! ), they had loads of marshals everywhere, plenty of water and a great medal and goody bag. I already have the date for next years entries in my diary so we can sign up. 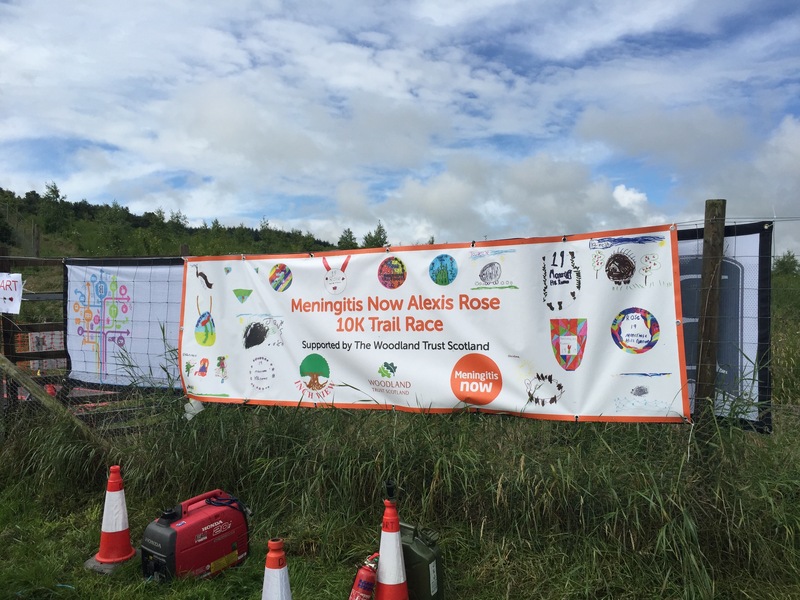 The whole event inspired my husband and I that much that we are now raising money for the Alexis Rose Meningitis Memorial Fund when we do our half marathon in September. 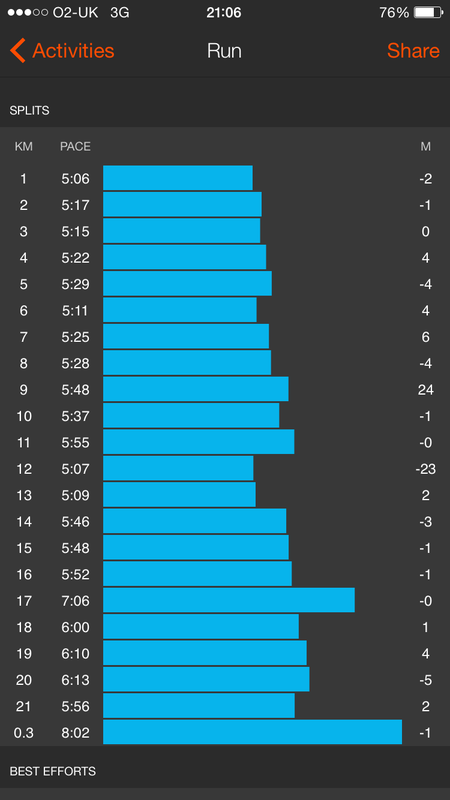 Just a quick post this one – I’ve been following my half marathon training plan quite well but it works in time and not distance which I have been finding hard to adjust to. So, I decided for the long run I would aim for 10 miles. Theory being its only about 5km after that to get me to half marathon! I dropped the kids at my parents and set off from there. I knew roughly a route that was around 10miles and I’ve found if I plan it in my head I feel better about it. The first 4km (sorry, I know I’m jumping back and forth between miles and km) are pretty much down hill – very little incline. Once I hit the first bridge though it goes up and I really felt the increase. Kept going at a good pace though and continued up and over the second bridge. Round the park and back over the 2 bridges and this is where it began to hit. The last 4km were the first 4 so naturally, as they were downhill coming out, they were uphill going back. This may have been a flaw in my plan but to be honest I was concentrating on distance not speed so there was a lot of ‘up, up, up’ chanting coming from me. I did briefly consider going that little bit further but by the time I was close to my parents house I was done. When I tell myself I can – I can. A good play list is a must! Yesterday my daughter and I participated in Run or Dye – a running event where they through coloured cornstarch all over you to signify you getting rid of all black omens and moving forward. It was a fun event and one I thought Lucie (my daughter) would really enjoy so I had signed us up. We went to the registration tent and got our ‘swag bag’ which had a t-shirt and race number in as well as a packet of colour. Lucie got stuck right in with the entertainment and was covered within 5 minutes! She loved it. 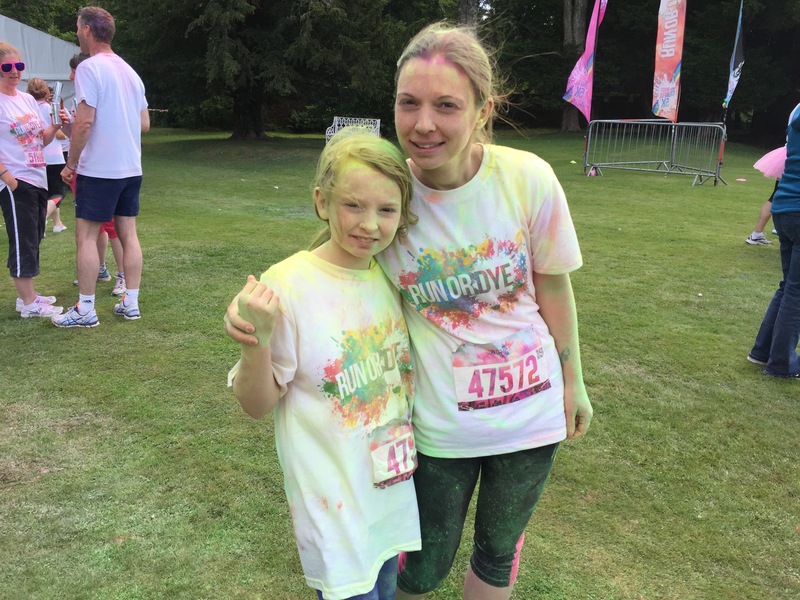 We set off on time and stared well – until the first time we ran through the colour station and Lucie didn’t close her mouth so got cornstarch in the back of her throat! Lesson learned! She didn’t run a great deal but she was really tired from the day before so we went quite slow. It was an uneventful course to be honest, nothing much to say about it. I had my running app and low and behold the course came up short – it measured 4.3k! That to me is quite a bit short! I wasn’t happy with that! Lucie on the other hand was ha ha. There was no medal unfortunately – I did think there would be and Lucie was hoping for one. We did cover my mum in starch at the end though which she took very well. My daughter wants to do this one again next year so you never know. A little late in posting this but I’ve had quite a bit on. Still, I haven’t forgotten! I decided to do both the 10k and 5k for a number of reasons. 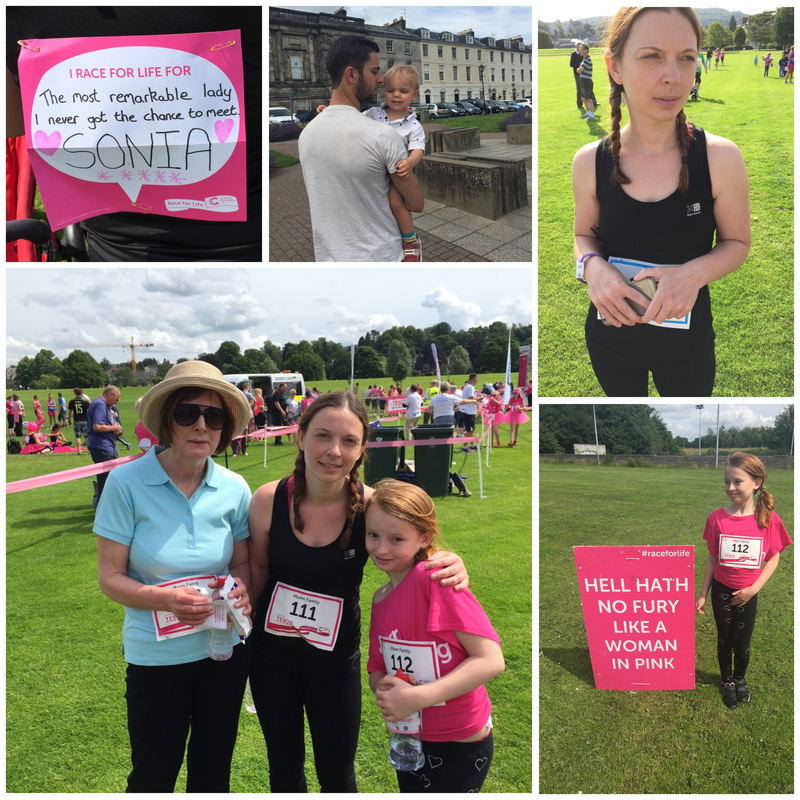 I wanted to do the 5k with my mum and my daughter to encourage them and I knew they wouldn’t be able to run the whole way. Doing the 10k before it would get most of my energy out of the way and I wouldn’t get that frustrated feeling which wouldn’t be fair to my mum or daughter. It would feel more challenging doing it this way too. Morning of the race and my husband came down with me as the weather was good – he brought our youngest in his buggy and he got flags so he could keep him entertained. I was nervous even though there wasn’t a lot of people – I think it was because I knew there would be people from work there and that made me a little anxious. I headed off to the start line and tried to get quite near the front, confident enough that I could do a fairly good time. I hadn’t realised it was 2 laps of the same circuit though and I have to say I’m not a fan of that. Still, we set off on time and I had decided, because of the way I was feeling, to put my earphones in and try to focus my mind and get past the anxiety. I made not bad time on the first lap – it was along a route I do often so I enjoyed that. Round the park and back out again and I was going past the walkers on their way in. Many were dressed up which gave me a giggle. As I was coming back in to the park I met a few from work on the other side of the path heading out – they were in good spirits and I heard them over my earphones! 😄 As I crossed the finishe line it said 54mins which is a great time for me but my running app said it wasn’t 10k so naturally I had to keep going until it did – spot the saddo ha ha. I had about 40mins before the 5k started so I grabbed some water and waited with the hubby and little one until it was time. My mum was nervous but I kept telling her she could manage this no problem. We set off at the back of the joggers and my mum started jogging for a bit. I kept telling her to slow down a bit but she was going for it! She practically jogged the whole way round! My daughter on the other hand wasn’t quite so in to it. She was quite tired and I don’t think she was really feeling it. We finished the 5k in a really good time and I was very proud of my mum. My daughter was really tired and went back to her dads for a sleep ha ha. I will definitely do it again next year. I was surprised there weren’t more people there to be honest, I had been expecting quite a few more! It was good though and we all enjoyed it. Not that the title is a give away or anything but yeah, my timed 5k was a success! Met as usual at the standing stones and there were only 4 of us that turned up. I had taken my bike to get there and back so chained it up and sat on the stones for the 0-5k group to finish. The weather was very overcast and was drizzling rain at us but it wasn’t too bad. We had the usual discussion of how things had gone that week and I mentioned my knees were hurting a little. I said I was pretty sure it was down to squats in circuits class the night before and the trainer that takes the running group showed me where I was going wrong! No more sore knees for me! Anyway, all too quickly we were off, and I really wasn’t in the mood. The guy who has done a lot of running wasn’t there (not that I use him to pace as he’s too fast for me) but the other girl who I am just a little slower than was. Started as usual and I was going to try and pace behind her but decided to just go ahead and focus on pushing for when she undoubtedly overtook me. The route is 2 laps round the local park and about 300m more and it was a nice surprise to see our trainer cross the park to encourage us on. Naturally the rain started to get heavier so I tried to focus more and more on lifting my knees higher. I think a lot of my hill runs have been helping with this as it felt a little better. Got to the stretch where the other girl normally overtakes me – but – nothing. I refuse to look behind me to see where she is as ultimately I’m racing against myself 5 weeks ago not anyone else. It is strange that I can’t hear the trainer shouting at anyone else though. Up to the home stretch and he’s shouting at me to go faster (are you kidding?) I try and manage a measly little increase trying to ignore the people around watching and finish – in the pouring rain. My time? 25mins 30secs! It took me weeks and weeks to get under 30mins and now I’m under 26! I am really pleased with this! The other girl came in and it turns out she had sore shins so that explains how she never over took me. Her best 5k is still faster than mine by about 6 seconds. The oldest member came in not long after and my word she came in fast – talk about a strong finish! Going to miss the group until it starts up again – it’s been worth every sweaty, breathless minute! I can really see improvements in myself. Tomorrow is the race for life and I’m doing the 10k myself then the 5k with my mum and my daughter. Just hoping it’s not pouring with rain! I have my last session with the running group tonight before it breaks off for the summer. We have our 5k timed run to see if we have improved since week 1. Ive really been looking forward to it until today that is as I’m not feeling great. After circuits last night my knees are hurting from all the squats and the weather is just so muggy you can hardly breathe properly. We had thunder and lightning last night and it looks like more of that tonight. A little down heartened by it as I have been hoping to really see results but just not feeling like I have it in me tonight. Still going though, and hoping to get a good time. Even if I don’t I feel it’s still been worth while.